WHILE profitability and cattle supply is currently tough enough across the Australian feedlot sector, there’s no shortage of evidence of operators prepared to look over the horizon, with considerable expansion happening in feedyards across the country. 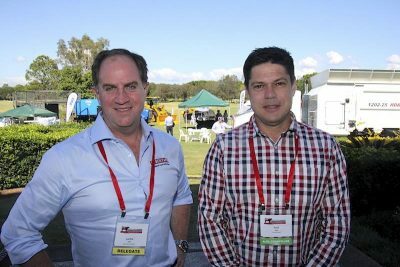 Accounts of various capacity development projects – either recently completed, under construction, or about to be implemented – were not hard to find among delegates attending the BeefEx feedlot conference being held on the Gold Coast this week. 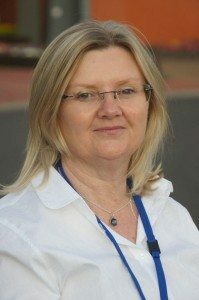 Australian Lot Feeders Association president Tess Herbert acknowledged the trend, saying it had been quite some years since there had been as much evidence of expansion activity in the industry. “Some of these projects are the result of plans that have been put in place for a long time, while others are more recent,” she said. Ms Herbert said another part of the explanation for the expansion trend may be the growth in some yards in Wagyu feeding, requiring extended days-on-feed, tying-up pens for longer periods of time and reducing stock turnover. Here’s a couple of examples of expansion projects we came across at the BeefEx event yesterday. 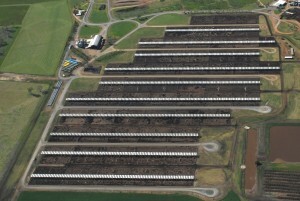 In South Australia, the Iranda Beef feedlot operations are located neat Tintinara, a couple of hours out of Adelaide. Iranda has recently completed a major expansion from 3500 to 15,000 Standard Cattle Units, making it easily the largest yard in South Australia, and the biggest in Australia outside the three eastern mainland states. Iranda Beef is a joint venture involving vertically-integrated processor, Thomas Foods International, and managing director, Paul Vogt, whose family established the yard in 1992, and underwent and expansion to 3500 head seven or eight years ago. The bulk of the capacity expansion will be devoted to TFI’s growing Angus grainfed programs, but the yard will continue to supply a large Woolworths supermarket contract for 320 steers and heifers a week. TFI took a stake in the Iranda Beef business two and a half years ago, in line with the company’s meat processing expansion at its nearby Murray Bridge plant, about an hour from the feedlot. Greater feedlot capacity at Iranda will help underpin larger kills at the Murray Bridge plant. The feedlot expansion project was only completed in the past three months, and the yard currently has about 11,000 head on feed, expecting to move to full operating capacity of 15,000 SCU (effectively, about 17,000 head, including domestics) by Christmas. Kerwee’s Lachie Hart, left, with Iranda Beef’s Paul Vogt at BeefEx yesterday. “It’s not an ideal time to be trying to expand, give the current difficulty in sourcing feeders across southern Australia, but we’re in it for the long term,” managing director Paul Vogt told Beef Central. He said the larger capacity had seen the yard’s cattle procurement footprint expand, with the yard’s first runs of feeders from properties in Western Australia arriving next week. Other feeders are being sourced from as far afield as southern NSW and across Victoria, as well as local SA cattle. As part of the expansion, the yard has also built a new feedmill, currently using grain tempering, but with the ability to move to steamflaking at some future time if required. In its original form, the yard simply dry-rolled grain for rations. “It’s not just adding pens – we’ve added a whole lot of new infrastructure, including a new induction facility, double load-out ramp, and extra receival yards, which well and truly expands the number of cattle we can handle,” Mr Vogt said. Staffing has now grown to 18-19 permanents, sufficient to comfortably feed 17,000 head. One estimate from a stakeholder close to the project put the total expansion cost at $10-$12 million. Meanwhile the Hart family Kerwee feedlot near Jondaryan on Queensland’s Darling Downs has received development approval for expansion from 11,100 head to 20,200 head – not far off double current capacity. Operational approval, the last exercise with council, is expected by next week. Tenders have been received for the project, and will be awarded shortly. Stockyard managing director Lachie Hart said demand for the company’s high quality branded beef programs was currently exceeding supply, and was the main reason for the decision to expand capacity. “But what’s enabled us to do that has been some changes in Queensland’s environmental licensing arrangements, which allows feedlots to use odour modelling, as opposed to the feedlot guidelines, to show that the business can operate effectively, without impacting on the surrounding community,” he said. Kerwee was the first Queensland beef feedyard to gain such expansion approval, but the modelling has been used already by state shire councils for approvals for poultry operations and piggeries. “It’s existing methodology – but it’s now being applied to the Queensland cattle feedlot industry,” Mr Hart said. He anticipated, however, that there would be further Queensland feedlot expansion applications under the odour modelling provision. Toowoomba-based civil engineers Ostwald Bros have been involved in many of the recent expansion projects in eastern states. Beef Central plans to examine the extent of the current expansion trend in feedlot capacity in greater detail in an upcoming article.